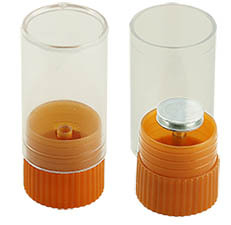 EM-Tec SB1 single pin stub storage tube is ideal for storing or transporting single pin stubs up to Ø19mm. EM-Tec SB77 high capacity wooden box with 77 storage positions for standard Ø12.7mm pin stubs. EM-Tec SB176 high capacity wooden box with 176 storage positions for standard 12.7mm pin stubs. EM-Tec SB4 clear styrene box for storing up to four standard Ø12.7mm (1/2”) pin stubs. 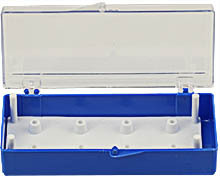 EM-Tec SB8 clear/blue styrene box with 8 storage positions for standard Ø12.7mm pin stubs. EM-Tec SC12 clear combi styrene box with 12 storage positions for standard Ø12.7mm stubs. EM-Tec SB28 medium capacity clear styrene box with 28 storage positions for standard Ø12.7mm pin stubs. EM-Tec SB153 high capacity clear styrene box with 153 storage positions for standard Ø12.7mm pin stubs. EM-Tec SB10 Stub-Storr low cost white cardboard box for storing up to 10 standard Ø12.7mm (1/2”) pin stubs or 2 of the Ø25.4mm (1/2”) pin stubs. EM-Tec SB1 single pin stub storage tube is ideal for storing or transporting a single pin stub. Protects the SEM specimen on the pin stub from cross contamination. Capacity is a single pin stub with 12.7 or 19mm diameter. Designed for 3.2mm pins with various lengths (6, 8, 9.5 and 14mm) The pin stub is held firmly in the brown LDPE cap (base) of the clear polystyrene tub. Maximum specimen height is approx. 20-25mm. EM-Tec SB2 heavy-duty large single pin stub storage tube is ideal for storing, shipping or transporting a large single pin stub. Protects the SEM specimen on the pin stub from cross contamination. Capacity is a single pin stub with 12.7 or 19mm diameter. Designed for 3.2mm pins with various lengths (6, 8, 9.5 and 14mm) The pin stub is held firmly in the blue LDPE cap (base) of the clear polystyrene tub. Maximum specimen height is approx. 18-23mm. EM-Tec SB3 heavy-duty large single pin stub storage tube is ideal for storing, shipping or transporting a large single pin stub. Protects the SEM specimen on the pin stub from cross contamination. Capacity is a single pin stub with 25.4 or 32mm diameter. Designed for 3.2mm pins with various lengths (6, 8, 9.5 and 14mm) The pin stub is held firmly in the blue LDPE cap (base) of the clear polystyrene tub. Maximum specimen height is approx. 18-23mm. 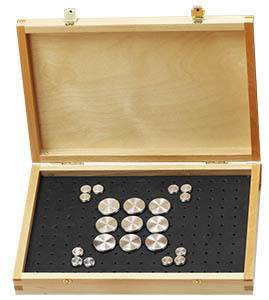 EM-Tec SB77 wooden box with 77 (7x11) storage positions for standard 12.7mm pin stubs. 20 storage positions for 25.4mm pin stubs. Pin stubs up to 100mm can be stored in this box. Made from beech and birch wood with a solid clear coating on the inside and outside. Includes two brass plated hinges and a single clasp. Outside dimensions are 189 x 138 x 46mm; 25.5mm inside clearance which leaves a maximum sample height of 22mm on the pin stubs. Light sensitive specimens are protected when the box remains closed. Medium size archiving box or for protecting valuable sample or calibration standards. 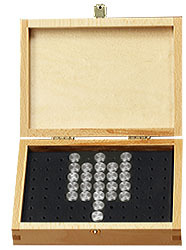 EM-Tec SB176 wooden box with 176 (11x17) storage positions for standard 12.7mm pin stubs. Storage capacity for 40 of the 25.4mm pin stubs. Pin stubs up to 100mm can be stored in this box. Made from beech and birch wood with a solid clear coating on the outside and inside. Includes two brass plated hinges and two clasps. Outside dimensions are 276 x 189 x 46mm; 25.5mm inside clearance which leaves a maximum sample height of 22mm on the pin stubs. Light sensitive specimens are protected when the box remains closed. The is the ideal long term storage box or to protect valuable samples. EM-Tec SB4 clear styrene box for storing up to four standard Ø12.7mm (1/2”) pin stubs. LDPE insert holds the pin. Insert comprises a central post to prevent sample touching the lid. Outside dimensions are 75x40x22mm, with a maximum sample height of 6mm on the pin stubs. 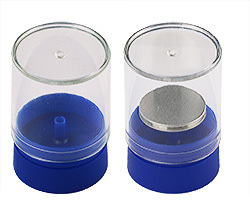 EM-Tec SB8 clear/blue styrene box with 8 storage positions for standard 12.7mm pin stubs. 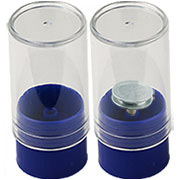 Made from polystyrene with clear lid and blue base with LDPE insert with posts. Outside dimensions are 116 x 55 x 32mm, 13mm clearance which leaves a maximum sample height of 10mm on the pin stubs. 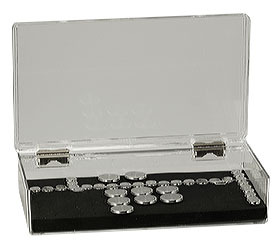 EM-Tec SB28 clear styrene box with 28 storage positions for standard 12.7mm pin stubs. Pin stubs up to 50mm can be stored in this box. Made from clear polystyrene with two hinges and lock. Outside dimensions are 120 x 84 x 36mm; 17mm inside clearance, which permits a maximum sample height of 13.5mm. Full visibility of samples in this clear styrene box. Low cost pin stub storage box; ideal for short term storage and handling. EM-Tec SB153 clear styrene box with 153 (9x17) storage positions for standard 12.7mm pin stubs. Storage capacity for 40 of the 25.4mm pin stubs. 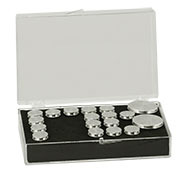 Pin stubs up to 100mm can be stored in this heavy duty box. Made from clear polystyrene with two brass plated hinges and snaplock lid. Outside dimensions are 275 x 160 x 57mm. The 34.5mm inside clearance leaves a maximum sample height of 31mm on the pin stubs. 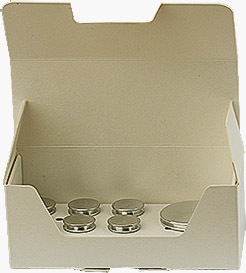 Full visibility of samples or holders through the lid. 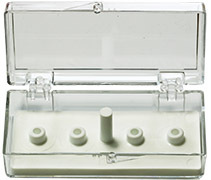 This clear and heavy duty high box is ideal for storing pin stub based SEM sample holders and larger specimens. Cost for storing pin stubs in this large capacity box is 40-50% lower, compared to pin stub storage boxes holding only 14 or 18 pin stubs. EM-Tec SB10 Stub-Storr white cardboard storage boxes for Ø12.7mm or Ø25.4mm pin stubs. These sturdy cardboard boxes offer a cost-efficient and compact storage solution for both standard pin stubs and the short Zeiss pin stubs. Made from clean 350g/m2 white cardboard. The insert is secured in the box to prevent it from moving upwards. Storage capacity for 10 Ø12.7mm or 2 of the Ø25.4mm pin stubs of the 25.4mm pin stubs. The Stub-Storr box size is 38x38x90mm (L x D x H); inside clearance is 20mm, which leaves a maximum sample height of 17mm on the pin stubs. Ideal for educational setting, storage of non-critical samples, temporary storage or large volume/low cost storage. The EM-Tec Stub-Storr boxes are supplied flat in packs of 10, 50 and 100.